Turning trash into electricity. What was once an idea of the future has become a reality today. And it’s happening in Hawaii. Currents in the Pacific have brought derelict fishing nets and gear to the waters around the islands. These nets are a safety hazard to ships, and cause extensive damage to the ecosystem by snagging on coral reefs, entangling wildlife, and polluting shorelines. Instead of adding these nets to already congested landfills, Hawaii’s multi-partner marine debris group came up with a unique program to “down-cycle” this marine debris into usable electricity. The process has many steps. The nets are first collected and placed into a container or port receptacle. They are then sent to a scrap metal recycling facility where they are unloaded and chopped into small pieces. Next, the net fragments are transported to a facility designed to convert the waste into energy. It is here that the nets are burned, producing steam, which drives a turbine that creates useable electricity. In fact, 832 tons of nets have been used in this program – enough to power over 300 homes for a year. Over a dozen public and private agencies make the Nets-To-Energy program possible. This includes support from NOAA’s Marine Debris Program. Working together, these partners have literally found a way to make cleaning the environment a source of power. For every 100 tons of net that is recovered, enough electricity is produced to power 43 homes for an entire year! In 2012, NOAA and its partners collected 50 metric tons of marine debris from around the Northwest Hawaiian Islands. 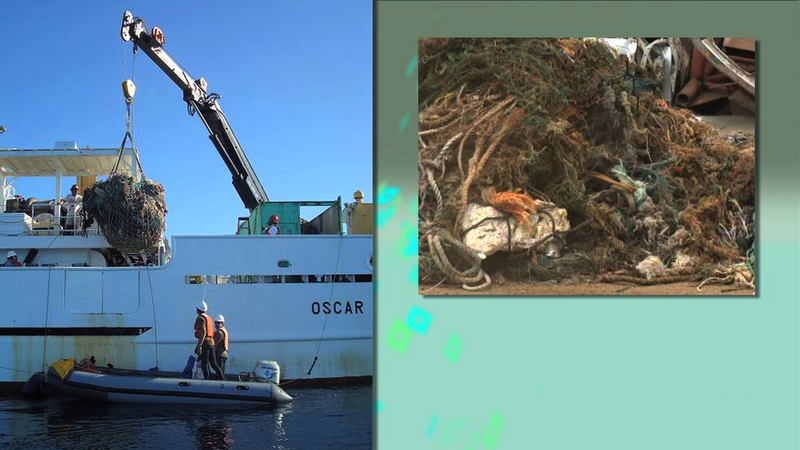 Today, all NOAA-funded marine debris removal projects in Hawai’i incorporate this recycling as a component for success.